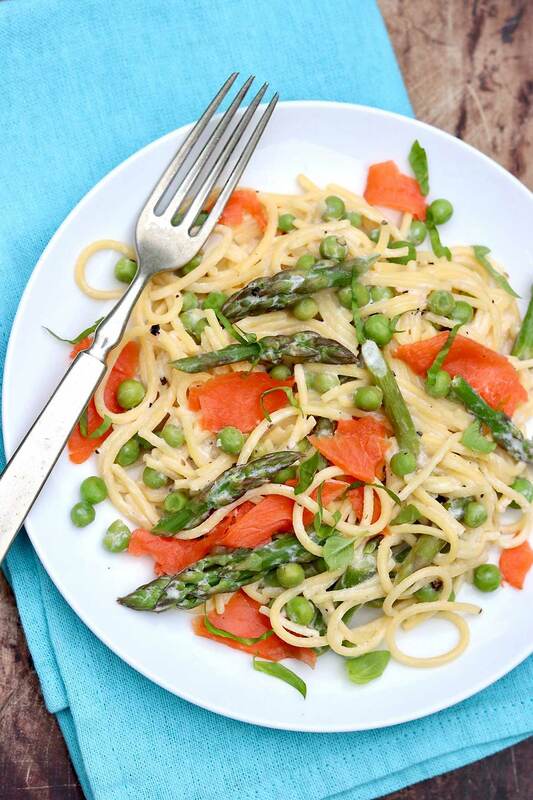 One-Pot Spring Pasta with Smoked Salmon ⁓ A streamlined cooking process, lots of veggies, and filling protein make this fresh and flavorful pasta dinner a winner! Though “spring” is in the name of this delightful recipe, I fully encourage you to partake of it well into the summer for its light, bright flavor and effortless appeal. It’s the sort of all-in-one meal you can pull off on a busy weeknight, yet it’s every bit special enough for company. Besides, spring isn’t officially over yet…and it was rather late in coming this year, anyway! Lightly adapted from an Epicurious recipe, I adore the way the smoky, briny salmon perks up this dish without overpowering. With the splashes of pink and green, the plate is visually appealing, too. When we recently enjoyed this for dinner, my younger son asked if it was a Mediterranean dish. He knows that this style of eating involves lots of fish and colorful vegetables, and this pretty dish clearly suggested that to him. The lemony flavor adds a certain freshness to the meal, which feels light yet filling and mildly indulgent all at the same time. If you expect leftovers, top each plate with the amount of salmon you need for the first night, and store what’s left separately from the pasta. That way, when you reheat the pasta, you won’t end up cooking the smoked salmon. Leftovers taste great this way, although I’ve also cut the recipe in half for a delightful dinner for two. 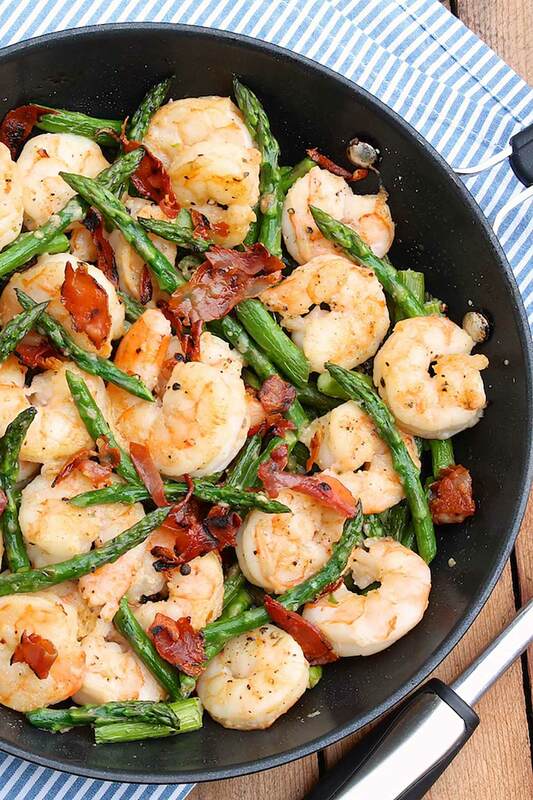 Sautéed Shrimp & Asparagus with Crispy Prosciutto & Parmesan is another one-pan meal that’s light and fresh and so full of flavor. A streamlined cooking process, lots of veggies, and filling protein make this fresh and flavorful pasta dinner a winner! Cook the pasta in a large pot of boiling salted water, stirring occasionally, until a tad under al dente, 7 minutes (or 2 minutes less than package instructions). Add the asparagus and continue to cook, stirring, for 1 minute. Add the peas and cook until hot, about 1 minute more. Reserve 1/2 cup of the pasta cooking liquid, and then drain the pasta, asparagus, and peas together. Transfer the pasta and vegetables to a large bowl—or back to the now empty pot if preferred. Add the butter, lemon juice and zest, sour cream, 1 teaspoon salt and the pepper. Toss, adding the reserved pasta cooking liquid as needed, until a smooth sauce coats the pasta (you may not need all of it). Divide the pasta among plates or bowls. If the basil leaves are small, you can use them whole. If not, tear or thinly slice them as desired. Top the individual plates with the salmon and basil, and enjoy. 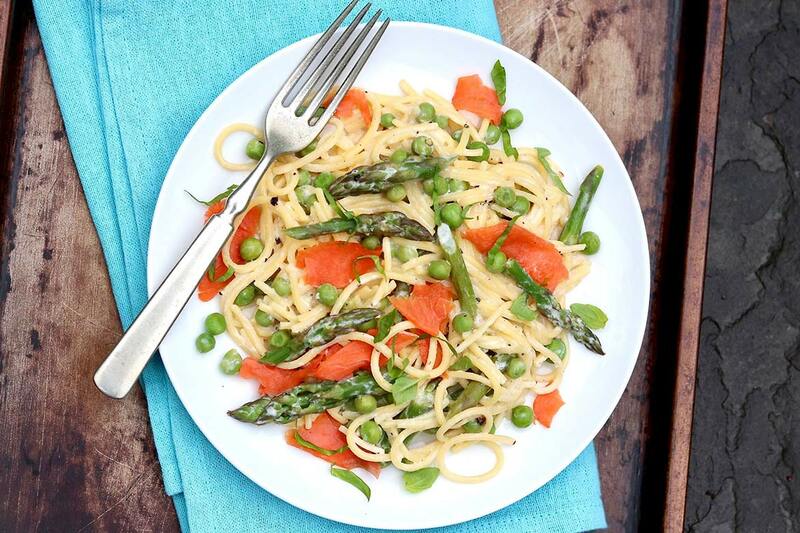 Just made this, minus the salmon and used sugar peas…so good! Sugar peas would be a wonderful addition or substitute in this dish, Sue. Thanks for mentioning and so glad you enjoyed! 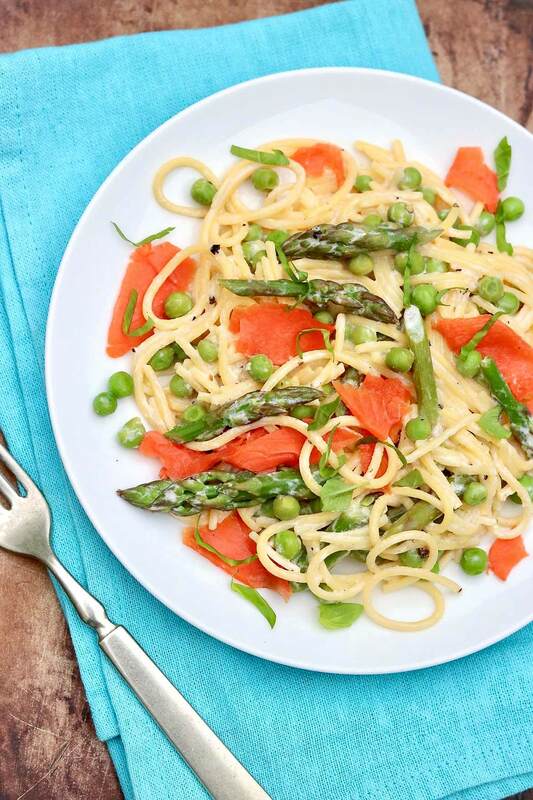 Delightful recipe to enjoy our fresh asparagus and the smoked salmon added so much flavor with ease. Will make again! Wonderful news, Katie. Thanks for letting me know! Just made this pasta and it was awesome. Didn’t have asparagus but the peas were great. I will definitely make this again. We love salmon and I never think to use smoked salmon. Thanks for sharing this light and versatile dish! I’m delighted you made and enjoyed, Deb. Thank you for the terrific feedback!